Two Catholic employees sacked from a Belfast hotel have been awarded £27,000 damages for religious discrimination. 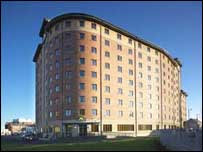 Riccardo Cafolla and Stephen Mooney were managers at Days Hotel until they were dismissed in June 2005. The two men took their case to the Fair Employment Tribunal which found they had been discriminated against. It followed loyalist attacks on the hotel after managers had disciplined staff. The attacks stopped after a meeting with the UDA. Mr Cafolla was awarded £16,110 and Mr Mooney received £11,600. The tribunal said that senior management in the hotel at the time did not wish to instigate disciplinary action against a particular employee as they feared this would lead to more attacks on the hotel. It stated that the attacks "were sectarian and directed particularly to Catholic employees of the hotel". It was satisfied that after the UDA meeting, serious attacks stopped but one of those employees disciplined continued to make comments to Mr Mooney. The tribunal decided that the two men had been disciplined after they told the company, Andras House, that they wished to begin a grievance procedure. Speaking after the FET decision was made public, Mr Cafolla said he felt "vindicated". "My chief concern in all this was to try to ensure the safety of the staff in the hotel. I am pleased that the tribunal has vindicated what I did," he said. Mr Mooney said the attacks and threats were frightening. "I was very upset to be dismissed when I knew we had done nothing to deserve it," he said. Eileen Lavery of the Equality Commission, which supported the case, said the FET found the hotel management had treated some staff more leniently than others. "To be dismissed following this dispute was unjustified and obviously distressing to the two men concerned. The tribunal has reflected that in their decision," she said. The hotel has refused to comment on the ruling.